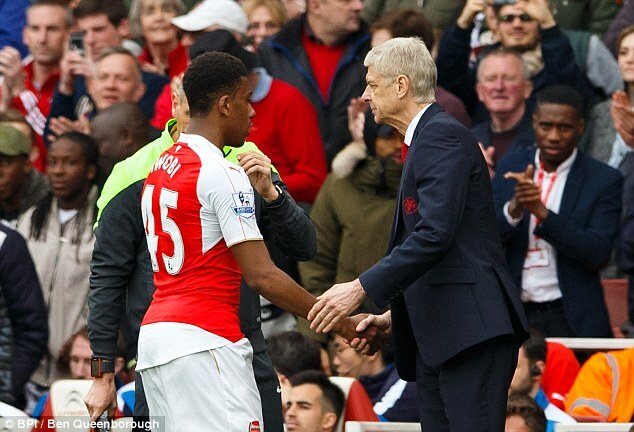 Super Eagles forward, Alex Iwobi has charged Arsenal fans to show some respect on team’s manager, Arsene Wenger. Iwobi was in the starting line up in Nigeria’s 1-1 draw against the Teranga Lions of Senegal in an international friendly match at the Hive Stadium on Wednesday. Alex Iwobi has called on Arsenal fans to ‘have a bit more respect’ for Arsene Wenger, and insisted that players at the club still back their manager. The Arsenal boss is under huge pressure following a string of poor results, with large sections of supporters calling for the manager’s head. ‘They need to have a bit more respect in my opinion,’ he told Sportsmail after Nigeria’s friendly draw with Senegal on Thursday night. ‘I mean, he’s been at the club for 20 years, he’s achieved a lot, obviously they’re a bit impatient with the results and where they want to finish. We also want to finish there, we want to win the league like anyone else, I can guarantee we are trying our hardest.